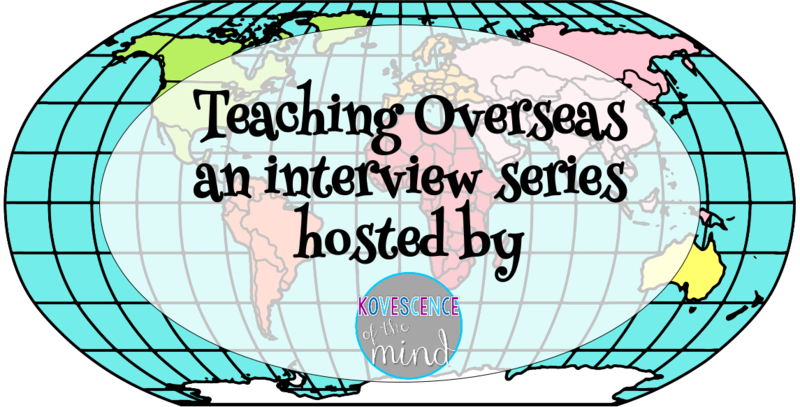 This is #2 in a series of interviews that I have conducted with teachers that have or are teaching overseas. This is a topic that is dear to my heart for several reasons. Lastly, one of my three brothers, who you met in POST #1, is currently teaching English in Saudi Arabia. I was there when he got on that plane in the wee hours of the morning, and his messages home inspired me to seek out teachers that have or are teaching overseas to have them share their experiences with my readers. I would like to welcome my sorority sister, Erica. I’m from small town Mount Pleasant, Michigan and I attended Central Michigan University for my undergraduate degree in education. Sarah and I were in the same sorority together and have stayed in touch over the years (bless social media!). We have spoken several times about my experience teaching overseas so when she asked if I would contribute to her blog to let people know what it is like teaching internationally, I of course said yes. What is your is your background and teaching experience? Ten years ago I was working at a fabulous visual and performing arts public magnet school in Pasadena, CA teaching a class of gifted and talented third graders. I thought by living in Los Angeles and teaching in Pasadena I had gotten about as far from my little farming community as one could get. I enjoyed my job, school, and my life in general. I figured I would work there for, well, ever. I had no clue that one phone call, a short meeting, and several quick decisions later I would be on a very different career (and life) path. In January of 2006 my husband was contacted by a former professor of his from when he did a study abroad for his master’s degree of architecture in India. He wanted my husband, Sam, to come and work with him for a period of three years at his studio in Mumbai. Having visited Sam while he was studying in India and then both of us returning the following summer to travel extensively, I knew that I liked the country, the people, and the food but had never imagined living there for an extend period of time. I told Sam I was up for it but that I had to also find work because I knew there was no way I could not work. So, using my husband’s professor’s wife as a resource I started to research schools in Mumbai and the surrounding area. On a visit to Mumbai in April of 2006 I interviewed with four schools in the city. I was offered a position at each of the schools but knew in my heart that the American School of Bombay (one of two international schools in the city that I interviewed with) was where I wanted to be. As it turns out, it’s where I still am 10 years later. At that point of accepting a learning support teaching position I had no idea of the vast network of international/American schools all over the world. I was clueless that the international teaching circuit is how many teachers spend their entire careers – getting married, having children abroad, and adding to the adventure. Having worked at schools in Michigan and then in Pasadena, I can easily say working internationally has been the most rewarding decision not just for my career but also for me as a person and for my family. In my ten years at The American School of Bombay I have been a learning support teacher, a multi-age classroom teacher, a third grade teacher, an Early Childhood four-year-olds teacher, and a Technology Integration Coach. My school currently has around 750 children from over 44 nations and 15 religions. Their parents are diplomats, business people, and teachers. My colleagues are Indian, Australian, Canadian, New Zealanders, French, and from the US with the fun and amazing thing being that this changes every year! The diversity is amazing and refreshing and keeps things new. Even in LA I never was exposed to so much variety of personalities and cultures. What are the things about teaching overseas? One of the best parts about teaching overseas – specifically at my school, is that I have grown so much as an educator and had the most amazing opportunities for professional development that I know just would not have happened in the US. Back in California, I had to go to trainings on how to implement the new reading books/curriculum. Here, I get to pick and attend the most amazing PD you could imagine! Most international schools provide a PD budget in addition to amazing opportunities within the school. In the last year I’ve done Cognitive Coaching training in India and Switzerland, I’ve been to Istanbul to interact with hundreds of other international teachers and learn about Socratic Seminars (a personally selected workshop), a PD in Johannesburg, South Africa had me digging into the importance of technology for breaking down boarders, and in two weeks, my school will host our next UnPlugged Conference focusing on providing access to technologies that empower learners and support the creation of 21st century learning environments. Other benefits to teaching abroad are that you are not limited to US curriculum and regulations. There are no high-stakes tests that determine funding or government intervention. With a greater focus on best practice instruction, standardized testing is a very, very small part of what we do. At my school, we use AERO (American Education Reaches Out) standards which are similar to Common Core and we are a PYP (Primary Years Program, the elementary version of the International Baccalaureate) accredited school. In addition, as these schools are private, I have all the resources and supplies I could want/need. Gone are the days where I was spending $2,000 of my own money each year for basics like markers, scissors, and glue. Another big plus is, depending on your post and package, there is a greater earning potential teaching abroad than in the US. Not to mention, my own children get to attend this amazing school! What are the challenges of teaching overseas? Of course, it’s not all rainbows and sunshine teaching abroad. The biggest challenges are those of being so far away from family and close friends and that of navigating a new culture and languages. Living in India has meant that I’ve missed some big stuff back in the US – weddings, the birth of my first niece, and the death of my grandmother were all events I could not up and head home for. The positive side of this is that my colleagues have become my “international family” and have been there for me for other big events like the birth of my two children and celebrating completing my second master’s degree as well as the smaller stuff like birthdays and anniversaries. And yes, I’ll admit that every trip back from the US means around half of our luggage contains food which we apparently cannot live without (I mean, Siracha is a necessary staple, right?) but none of this has us packing our bags for the next flight out. There are some people who give international teaching a go only to learn that it is just not for them. I’ve seen these people over the years but more often, I’ve seen people get sucked into this life and opportunity and embrace all that it is – crazy and wonderful. Are you thinking this is something you might want to try? Well, pretty much every country that has any sort of international commerce/business/trade center has at least one, if not multiple international schools that could potentially be your next place of employment! A little internet search will reveal what is available in different countries/cities. While most schools will post positions on their website and offer a way to apply directly with the school, more commonly, people use one or more of the international teacher placement services designed to assist in the placement of teachers overseas. The most popular service are: ISS , Search Associates, TIE Online, and Schrole, but several others exist. In addition to placing teachers online and via Skype type interviews, these companies also connect teachers at teacher recruitment fairs all over the world. Each company requires a membership fee and extensive bio, resume, and references before your profile can become active and schools can access your information. Every school is different in pay, package, and benefits so it is important to do your own research. Some schools will be a dream for you but you also need to consider where you’ll be living. If you are a huge outdoor person, a big busy city is not going to be the best fit for you. If you are unwilling to learn a new language (for life outside of school), a country that does not broadly speak English will likely be frustrating. However, if you are a go with the flow person, the options are really vast. I recently came across an article online that while not directly connected to teaching really did sum up what it was like to live abroad. If you want further perspective on what it is like, I recommend this article - 15 Things Only People Who Have Worked Overseas Can Understand. I cannot say enough about how much I love living and teaching abroad. If you want to know more about my experience, you can connect with me on Twitter @ericakiersten. Check out week one with my brother who is teaching English in Saudi Arabia.